Robert Alberino Jr. is a football lifer, dirtying his hands and knees not with a set of pads on his shoulders but, rather, with the weight of a video camera. 49ers Studios, the in-house media-production team of the NFL’s San Francisco 49ers, features robust technology for video production, including this studio in Levi’s Stadium that can be converted to shoot content in seven positions. Schooled on the streets of Philadelphia and the studios of Steve Sabol, Alberino has forever altered the video-production landscape. (Okay, okay, this might be a little dramatic, but that’s the way Alberino likes it). In a media era that seems to reward churning out quantity, he remains a staunch disciple of the Church of Quality. High-end storytelling is his mantra and plays a major role in the direction of the video-production group he leads as VP/executive producer for the San Francisco 49ers. With a career in which he has built up and overseen in-house media operations at the Kansas City Chiefs (2010-13) and the Philadelphia Eagles (1997-2010) after cutting his teeth as a young editor at NFL Films (working under the late great Sabol), Alberino is a key figure in the history of the NFL video industry. He has seen the concept of team-produced media from the days of its early infancy. In fact, his roots at NFL Films have played an incalculable role in molding the approach to video storytelling that he instills in his producers today. It’s the philosophy he has worked to instill in the organization since he came to town in spring 2013. His calling was to build the 49ers in-house media operations, with the understanding that a brand-spanking-new stadium would soon be completed. Today, Levi’s Stadium is one of the top sports facilities in the country, and his staff has grown to approximately 35 strong, led by Director, Game Day Production and Broadcast Operations, Aron Kennedy; Director, Production, Wil Blackwell; Director, Digital and Social Media Marketing, Meghan Ryan; and Art Director Aaron Llavore. Everything — from production to digital media to social media, creative, and marketing — falls under Alberino’s purview. Basically, any piece of content that meets the eyes of a fan is produced by his team. Alberino’s approach to media and storytelling began with establishing a solid technological infrastructure, and anyone who has built out a major video facility gets it: you have to make your one shot count because it might be the only one you get. That’s where Alberino called on the help of Kennedy. A longtime friend and a former colleague, he joined Alberino in the Bay Area in winter 2013. Armed with a robust budget, the two laid the groundwork for what keeps Levi’s Stadium and 49ers Studios humming at a high level today. 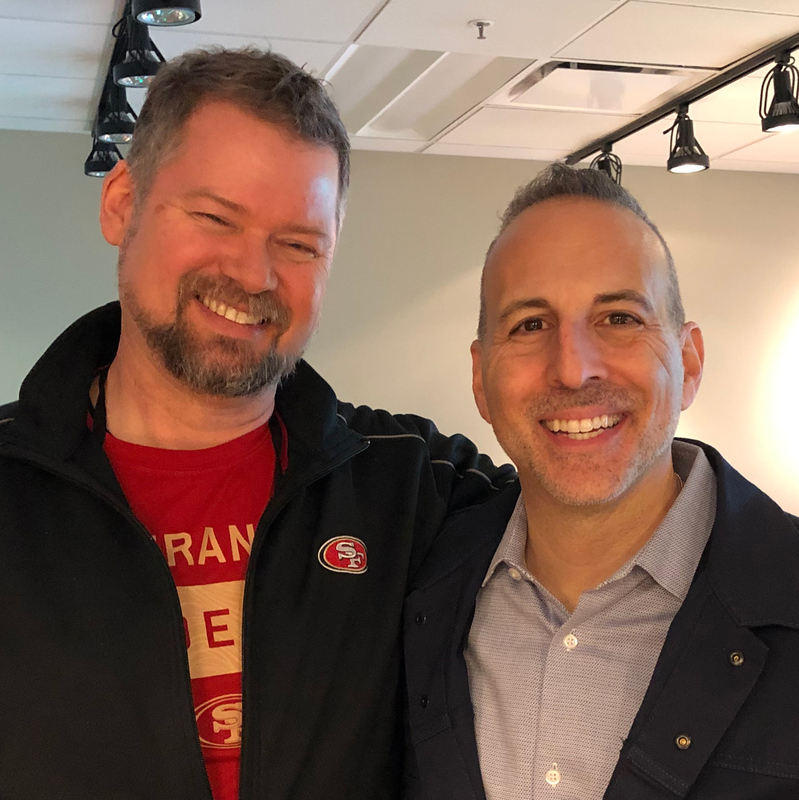 San Francisco 49ers’ Aron Kennedy (left) and Robert Alberino Jr. built an infrastructure designed to keep 49ers Studios nimble. For Kennedy, the key was to keep his facilities nimble enough to meet the needs of any major outside league or broadcaster that might want to push the envelope — be it WWE’s Wrestlemania or the NHL’s Stadium Series (both of which were here in 2015), CBS and Super Bowl 50 (which rolled into town in 2016), or the College Football Playoff National Championship Game (just last month). 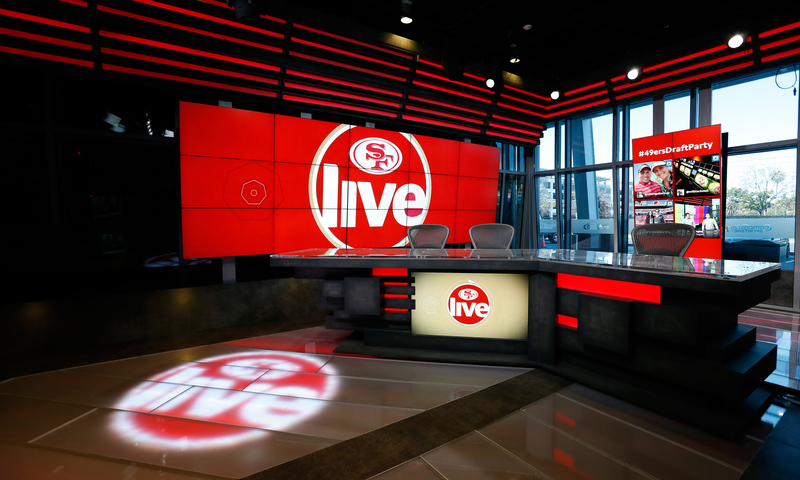 The technological key to 49ers Studios’ success rests in its flexibility to accommodate future growth and its ability to welcome in those major outside events. That is attributed to the investment in and commitment to an infrastructure built around single-mode and SMPTE fiber. Today, 49ers Studios remains built around a baseband core but with a conscious push to begin branching out into IP. The rack room inside the Levi’s Stadium control room features an Evertz Magnum Unified Facility Control system (with Vistalink Pro for monitoring) and an Evertz EQX router. Recently, the 49ers installed new Evertz EQX-IP cards (providing 32 IPGs in and out) to support future IP-based workflows. Kennedy acknowledges that it doesn’t make sense to go all-in on IP just yet, although the recent ratification of the SMPTE 2110 standard does have the industry moving in the right direction. Although the Levi’s Stadium videoboard is not a 4K screen, 49ers Studios has worked in some 4K for replay and high-quality archival content. The main control room has five Evertz DreamCatcher replay systems and a series of Sony-based gear that is very 4K-friendly. In addition to the Sony MVS-7000X production switcher in the control room, 49ers Studios has invested in a wealth of Sony cameras for both live in-stadium and field production use. The team has five Sony F55 cameras with BPU-4000 processors (which offer both 4K and high-frame-rate outputs), two Sony F55’s with wireless transmitters from Wave Central attached, and three Sony F55’s with Fujinon Cabrio lenses for studio shoots and other ENG applications. Besides the primary control room, 49ers Studios also uses a small studio elsewhere in the stadium to produce all kinds of content for its social-media channels, digital platforms, and linear-television partners. This studio is where the team’s ability to turn small spaces into highly flexible content machines really shines. When Alberino moved to the Bay Area to take on the task of building up the 49ers’ video-production operations, he spent many dinners at home drawing up ways to make the most out of a small corner of the stadium under construction. The result resembles a classic television studio, but a deeper look under the hood reveals its versatility. An anchor desk — with front-facing video screens — was developed by FX Design Group with LED lighting (for easy customization) and the ability to separate into two pieces for easy moving across the set. In addition, a large video screen behind the desk has approximately the same aspect ratio as the stadium’s main videoboard but can be split and slid around in five pieces. According to Alberino, the set can be positioned in a way to give 49ers Studios as many as seven possible shooting positions. On top of that, the whole room is run from a NewTek TriCaster and Blackmagic Design router that can be packed up as a portable kit and taken on the road. 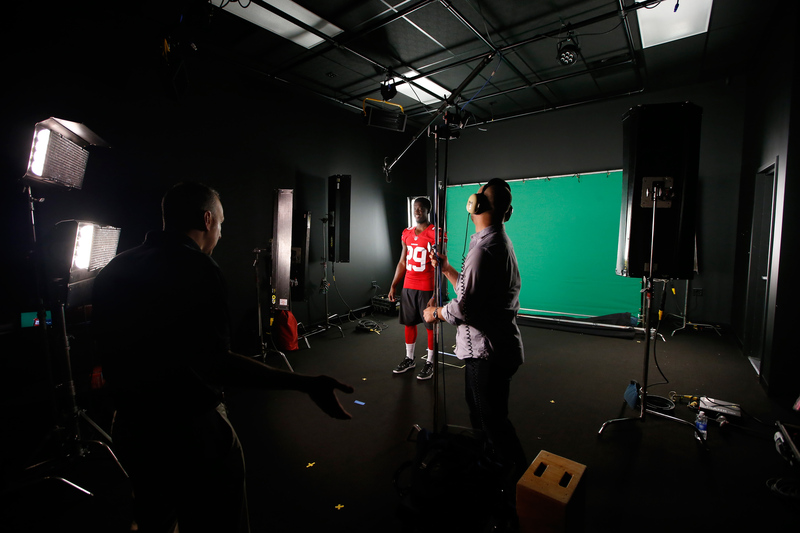 Robert Alberino (left) directs San Francisco 49ers safety Jaquiski Tartt (center) during a shoot inside a soundstage at SAP Performance Facility in Santa Clara, CA. Located just outside Levi’s Stadium, the building was previously Joe Montana’s personal racquetball court and was converted to a black box for video production, office space, and storage for 49ers Studios. Another small building just off the team’s practice field (SAP Performance Facility) adjacent to Levi’s Stadium is used for shooting everything from short interviews to videoboard hype videos. Converted into a sort of black box/soundstage, the building was remodeled with triple-insulated walls (protecting against the noise from nearby San Jose International Airport) and also provides extra office and storage space for the staff. In a fun bit of history, the building was actually the personal racquetball court of legendary 49ers quarterback Joe Montana. Looking forward, 49ers Studios is eyeing some offseason growth over the next couple of months, including integration of AWS Elemental encoders, Ross Video Xpression graphics technology, and the previously mentioned IPG routing. Despite being more than five years old, Levi’s Stadium has kept up as one of the top facilities in terms of cutting-edge tech, largely thanks to the forward thinking of Alberino and Kennedy. Work in sports for even a short time, and you’ll realize very quickly that it’s a small world. With nearly 25 years in the business, Alberino takes pride in some of the faces across the industry that he has been able to work with over the years. Much like legendary 49ers coach Bill Walsh, Alberino’s has an impressive “coaching tree” of those working in sports video. Besides Long on the Eagles video-production team, Senior Editor/Designer Dana Heberling and Production Manager Joe Helder worked under Alberino during his time there. Elsewhere across the industry, others who have been influenced by Alberino include Massad; Scott Kegley, executive director, digital media and innovation, Minnesota Vikings; Eric Stark, director, international marketing and content strategy, NFL; Alex Piper, VP, alternative entertainment, Fox Broadcasting; Chris Ubbens, senior content producer, New York Jets; and Nick Burton, team videographer, U.S. Men’s National Team, U.S. Soccer.